It was also the kids first day of school. Everyone was a little exhausted from the excitement of the day but we dropped them off with Gigi anyway. We talked about going out a different night. We really did. But we knew we wouldn't. We were going to go to some nice, tame old people restaurant. It was raining. And also just a little past 5:30. That screams salads and crab cakes with a small glass of wine, right? What do you do after half a bottle of wine on a Monday night? 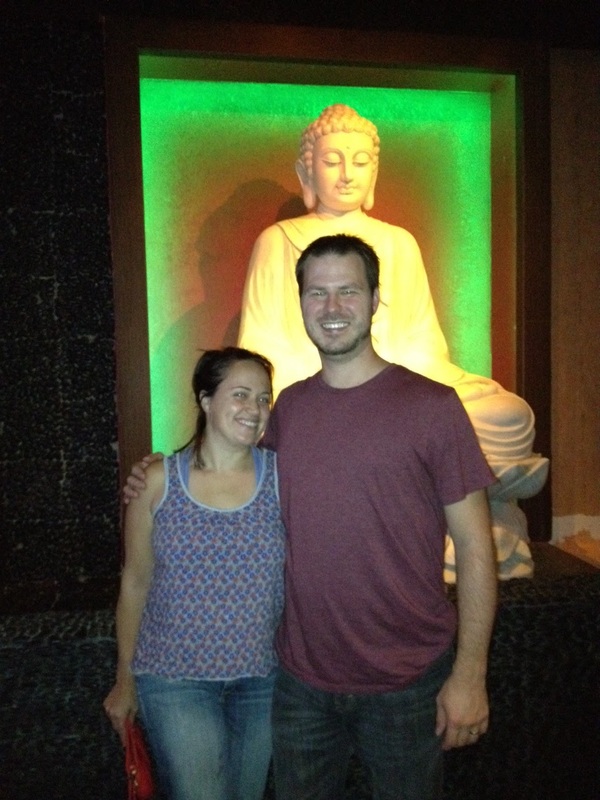 Make your waiter take a photo of you in front of a ridiculous glowing statue. DRUNK HAIR! CRAB CAKE AND SALAD CLOTHES! (Then transfer your sleeping children to their beds and proceed to have one more beer on the front porch while you talk to your sweet 16 year old neighbor (who, by the way, came over to borrow a TI-83; See? What? What? We still have hip calculators!) about how awesome college is and how he should go. HA. That's how YOU do an anniversary, right? RIGHT!? Holy hilarious! What a fantastic anniversary! RED STEAK, Asian figurines, beer on the porch, calculators, Adam Sandler, and praying that the kids sleep until it's light outside. That's the stuff dreams are made of if you ask me. Loose skin and old balls! My husband of seven (hey!) years likes to say that all the time. Your anniversary night sounded much like ours (sans-kids, of course). Congrats!